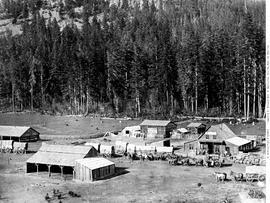 Roadhouse, known as Forrest House, in Fraser Canyon. Operated by George and William Boothroyd. Horse-drawn covered wagons. A fully loaded pack horse; Harrison Mills. A shipping scow on the Fraser River. Boston Bar, Showing Freight Wagons. Freighters At The Ascent To China Bar. Loading a pack horse at Harrison Mills. Mule team taking in freight at Yale for the Cariboo mines. B. Columbia. Mule team with freight at Yale. Starting for the Cariboo mines. Ox freight wagon on the Yale road. Ox teams at Yale, leaving for the Cariboo. Pack train on Hope-Princeton Trail. Headwaters of the Skagit and Whipsaw. 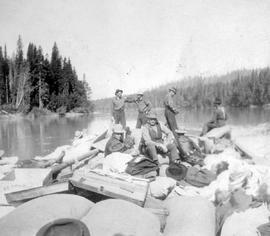 The Hudson's Bay Mule Team, Yale. The SS R.P. Rithet at Yale on the Fraser River.